Apologies to Vanya Tucherov for the late posting of this recap. I was without internet for a few days while I moved. It may be old news now but as we attempt to be your fan blog for BC Lions coverage, it still needs to be posted. After a lacklustre first half which saw the Calgary Stampeders score a last second touchdown to take a 7-6 edge into the locker room, the BC Lions came out and went toe-to-toe with the Stamps, with the Lions tallying four second half touchdowns to Calgary’s three and a pair of Rene Parades field goals, leaving the visitors to take the 34-32 victory over the Leos at Empire Field. While the first half last week in Montreal saw the BC secondary victimized, this week, neither side could get the offense untracked, resulting in an ugly, sloppy display from both sides with Travis Lulay only managing three completions for 25 total yards passing, with the rushing attack equally anaemic, mustering a total of 17 yards- two rushing losses and a Lulay keeper for 19 yards. Lions receivers dropped five passes in the half, and Lulay missed several of them on mid- to long-range seam routes. The second half, both offenses made adjustments, while the defences suddenly became inept. The half opened with Henry Burris leading the Stamps down the field, and capped with a Burris to Jon Cornish touchdown. Not to be outdone, Lulay and his recievers started to find ways to hook up, finding non-import reciever Akeem Foster with the 54-yard strike for the major to bring the Lions back to within one after the McCallum conversion. Burris would bring Calgary right back to tally another TD, this time finding Landan Talley from 16 yards out to stretch the lead back to eight points. Matching the Stamps drive for drive, Lulay brought the Lions back to match, sharing the load between Andrew Harris and Shawn Gore, with Gore doing the honours from eleven yards out. Not to be outdone, it was Burris again, taking only three plays to take Calgary back to paydirt, connecting with Nik Lewis on a 61-yard strike to restore the lead at eight to close out the third quarter. Opening the fourth, the Lion offense missed a step, going two-and-out on their opening possession, but the defence got good pressure on Burris and got the ball back following a pair of Joffrey Reynolds runs. Lulay found Geroy Simon for 30 yards on the first play of the ensuing possession, then S. J. Black for another eight down to the Calgary 17 yard line. Jamal Robertson carried for three yards, and Tim Brown took the ball in from six yards out on what looked like a broken option pitch play. The Lions went for the two-point conversion, but missed, with a Lulay pass falling just off the fingertips of Jamal Robertson. Stanley Franks would snare the third interception of Burris on the first play from scrimmage after the touchdown, but the Lions would prove unable to capitalize, going two-and-out again. Although the Lions special teams unit managed to hold the Stamps deep in their own end on the ensuing punt, the run defence would look a little suspect, giving up a 19 yard gallop to Cornish, followed by Burris completions of fifteen yards apiece to Romby Bryant and Talley before another pair of runs by Larry Taylor and Cornish again would set up the first of Parades’ field goals to stretch the lead back to five points. Lulay would get victimized for the second time on the evening, with Keon Raymond snagging the errant pass and returning it 24 yards before being brought down by Jon Hameister-Ries. The defence would hold, with Aaron Hunt coming up with the big sack on Burris on second-and-two from the 14, forcing the Stamps to settle for another field goal and an eight point edge with just over two minutes remaining. 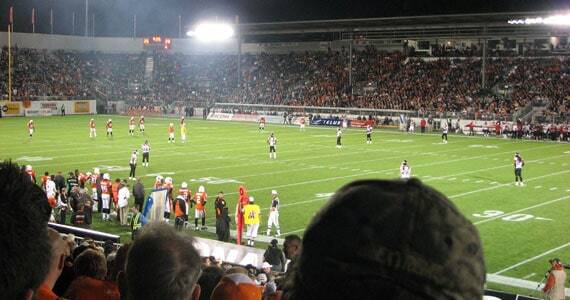 The Lions weren’t ready to surrender the field yet in front of the opening night crowd at Empire, with Lulay hitting Dobson Collins for a 45 yard gain, followed by quick strikes to Gore and Simon of eleven and ten yards respectively to take the ball inside the Calgary 10. After an illegal contact flag on Calgary’s Robert McCune, Lulay took the ball in himself from five yards out, diving to break the plane of the end zone on a scramble to his right, bringing the Lions back to within two points with just over a minute remaining. When the attempted conversion was dropped Geroy Simon, it looked as if the night might be over, but fate showed that there is a reason games are played until the final gun regardless of how bleak the outcome may seem. With fifty-nine seconds remaining and no timeouts available, it looked as if the Stampeders would just run out the clock- but Burris handoff to Reynolds on first down was about eighteen inches too high, resulting in a loose ball recovered by the Lions Solomon Elimimian at the BC 49 with 55 ticks left. A run, an incompletion, and two short passes later, the Lions had moved to the Calgary 48, but a final incompletion left them facing third-and-8 there, down two points. Paul McCallum came on to attempt the 55-yard field goal into the wind, but left it short and to the right, and keeping the confines of Empire Field not so friendly to the homestanding Lions, who now drop to 3-7 at the facility. No one stands out as exceptional on the offensive side of the ball. Travis Lulay’s line for the evening: 17 of 39 for 279 yards and 2 TDs, but also a pair of interceptions. He was also the only Lion to carry the ball more than three times or net more than ten yards, carrying four times for 28 yards and a touchdown. Among the receiving corps, Shawn Gore shows the benefits of the tutelage he’s been getting from Superman, catching seven balls for 96 yards, while Andrew Harris and Akeem Foster made their solitary catches count, each earning a major- Foster from 54 yards, Harris from 11. On the defensive side, defensive tackle Eric Taylor led the way with eight tackles and a sack, while Solomon Elimimian had five and was credited with the fumble recovery which made the last-ditch McCallum try possible. Adam Leonard and Dante Marsh also had fumble recoveries; while Marsh, Ryan Phillips and Stanley Franks had interceptions on the night and Aaron Hunt had the other sack. Special teams were not as strong as last week, yielding over two hundred return yards- 150 to Talley on five kick returns. This week the Lions travel to Edmonton to take on the Eskimos on Saturday. Edmonton, is the surprise of the early CFL season and the hottest team in the west, defeating Saskatchewan and Hamilton to open their season 2-0. Related: Tailgate Empire: Game 2: Relishing Empire, slow cooked ribs, amazing salads.